The lending library is probably one of humanity’s greatest cultural institutions (stands to reason, then, that the first lending library in the Americas was founded by a veritable cultural institute in the flesh: Benjamin Franklin). It’s an ideal that’s kept pace with technology—modern libraries are technical hubs in of themselves. And although your local library is now a place for internet access, for movies and music, its core mission hasn’t changed. Want a book? Borrow a book. It’s that simple, and that wonderful. My own local library system is at once both an exemplar and a standout in these regards. I’ve grown up with them—got my first library card at age eight—and have in turn watched them grow. They are and have long been a cornerstone of our community. So leave it to them to take library lending to the next level: the Art Library. It is precisely what it sounds like. 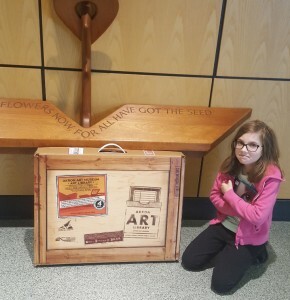 Partnering with our regional art museum and with area artists, it makes available original works—paintings, prints, mixed media—for borrowers to enjoy in their homes. We’re an art-centric city, happily enough, so even though there’s a fair number of pieces in the library’s collection, all were spoken for (presumably hanging happily on walls throughout the fair city) when I first made inquiries. 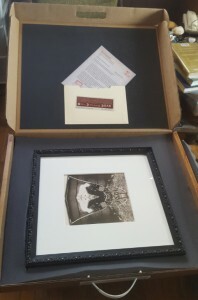 Reservations were welcome, however, so I pored over the catalog and spotted the one I wanted: an original Mothersbaugh. Yes, that Mark Mothersbaugh: son of Akron, Devo singer and keyboardist, celebrated visual artist. 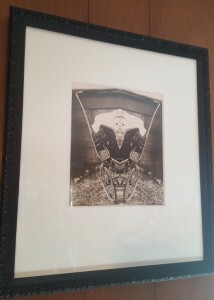 I chose his 2007 print, Ashtabula Perambulator. It’s a haunting image—a simple manipulation of a fairly mundane photograph, somehow resulting in a jarring, visceral imprint. 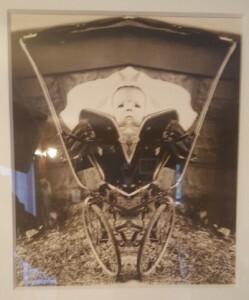 It’s a Rorschach blot straight from the uncanny valley. So I had to have it. Or more accurately, I needed to borrow it. The lending period is four weeks. Renewals and extensions are allowed, so long as other patrons haven’t submitted reservations. Mine was on the books, so whoever was previously enjoying Motherbaugh’s creation was duly put on notice. Finally, two days ago, I got the call. And do you know, we raced to the library? We did. The younger Deconstructor accompanied me, so most traffic laws were obeyed. But still, we raced. Even the faux-crating was exciting. Unboxing it was exciting. 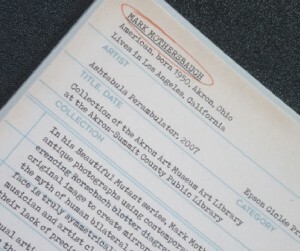 It was packed with care, complete with instructions for curation and display, for care and preservation, along with a laminated catalog card introducing the unwary to the Mind of Mothersbaugh. In an eyeblink, in no time at all, it was on my wall. And then time stopped (the way it must when good art is in the room) because all I could do was stand and stare. So that’s where it’ll stay, for a short while, at least. Four weeks, in all likelihood. But that’s okay. Because when my time is up I’ll just go borrow another. 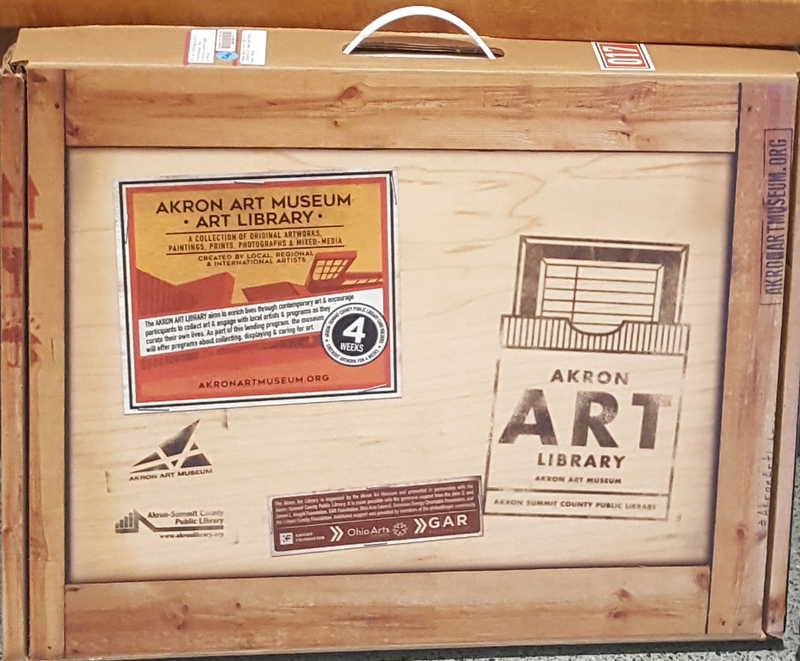 This entry was posted in New Post and tagged Akron Art Library, Akron Art Museum, Akron Public Library, Art, Ashtabula Perambulator, culture, Devo, Mark Mothersbaugh. Bookmark the permalink.